If you’re running a successful business but haven’t ever invested in SEO, you probably do not know where to start or how to determine what SEO could do for your business. Your friends have told you that it could do big things for your business, but you need harder numbers than that before you know what or even how to invest. 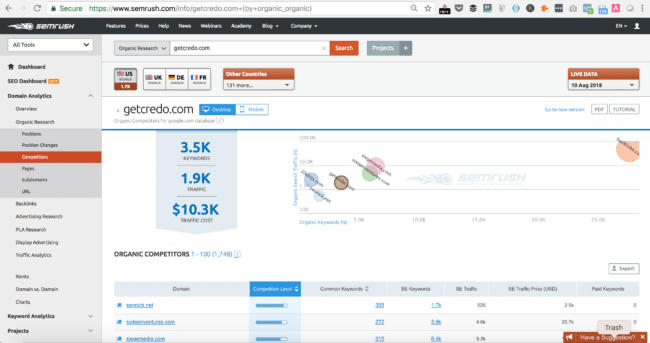 We’re now offering done-for-you SEO opportunity analyses on Credo to help people just like you. Learn more here. Time to pull and analyze data to understand the possibilities and keywords to target. I’m going to walk you through how this works step-by-step with screenshots to help you understand where you are in the process. Let us know in the comments what questions we can answer as you go through this. 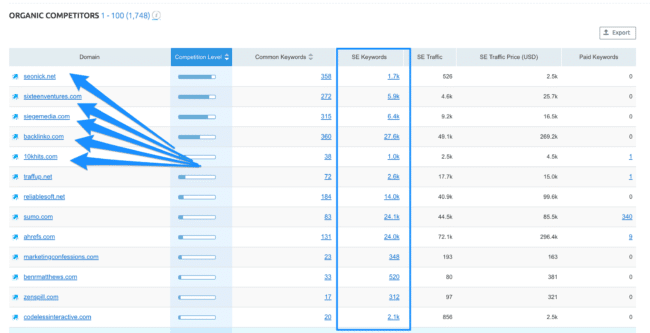 Do you understand the keywords you are ranking for currently? If not, then that is step 1 in the process. 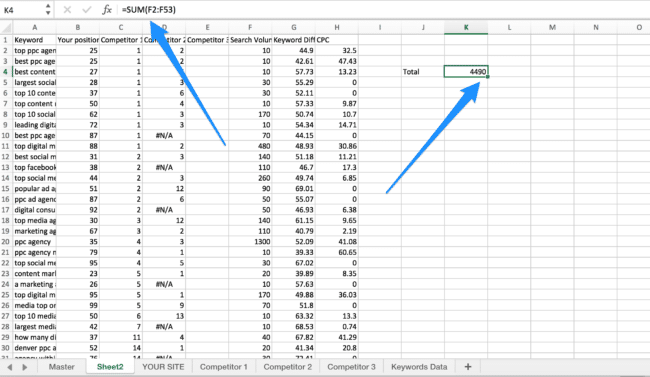 After you understand that, then you can do keyword research to understand if those are the right keywords and if you need to shift your strategy. 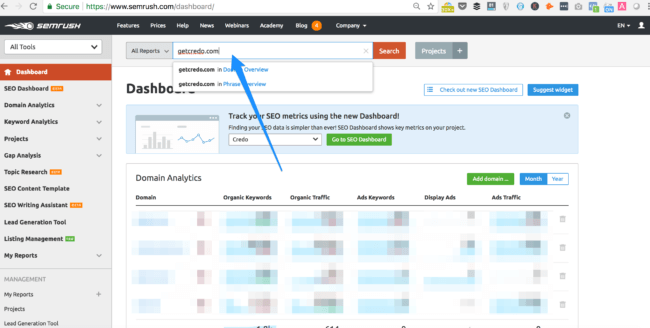 To complete this step, you need access to a tool like SEMrush or Moz. 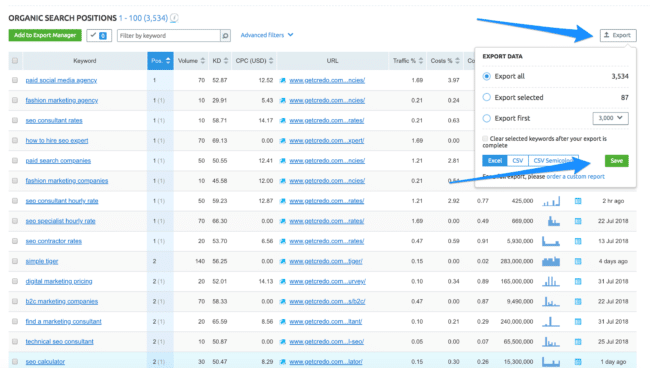 I am going to show you how to do this within SEMrush, but you can follow similar steps using Moz and their Keyword Explorer tool. Are the keywords you are ranking 1-3 for relevant to your business and will they attract the types of customers you are looking for? 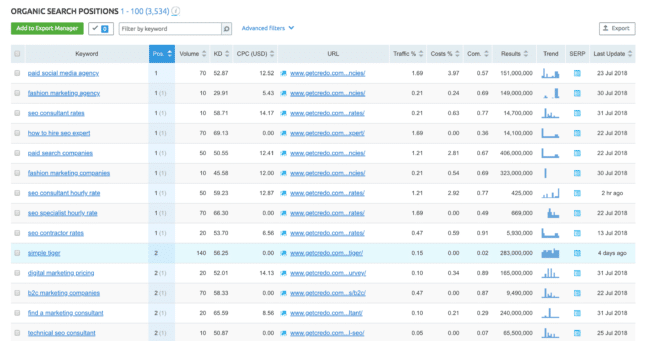 How much search volume is in the keywords ranking below position 3? Number 1 can really only be answered by you, with an understanding of your customer and how they should find you. 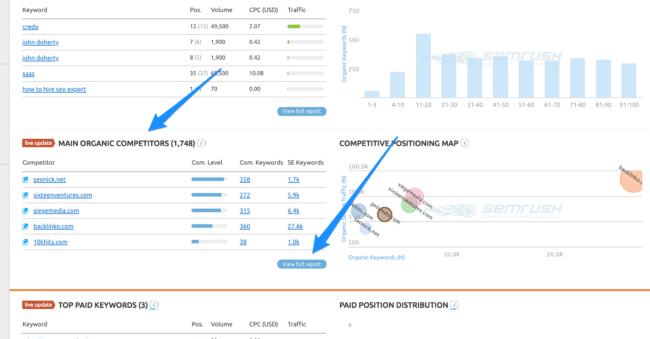 If the keywords are irrelevant, then you are likely receiving junk traffic and need to do a deeper keyword analysis. If they’re relevant, then you get to put together a strategy to get other relevant keywords ranking as well. 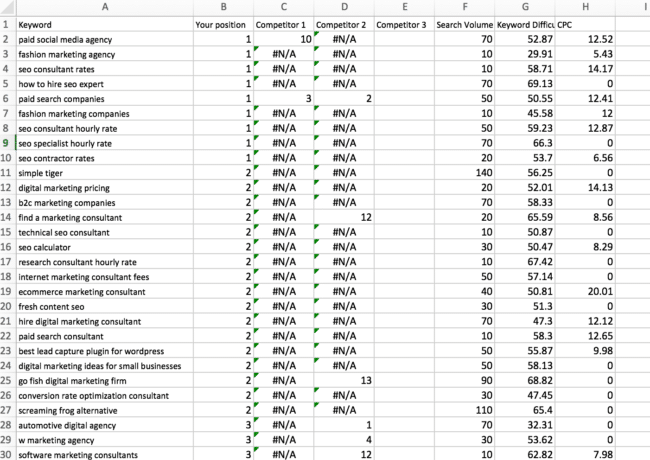 To solve #2, I like to do a Pivot Table with a chart overlaid (on Mac. 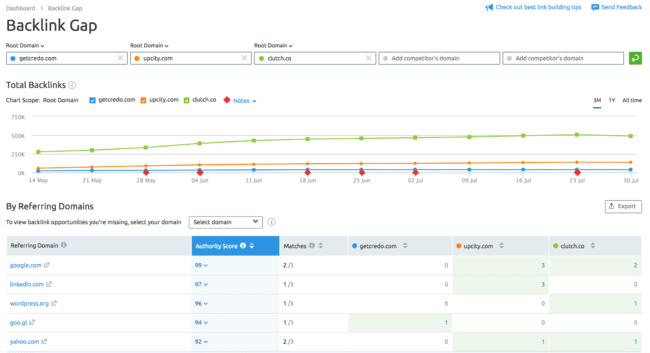 On PC, you have access to a Pivot Chart) to understand how much search volume per month is available in those buckets. Note: this isn’t the volume you could get, as clickthroughs are on a sliding scale. First position usually receives ~20-25% of clicks, 2nd position 10-12%, and so on down. As you can see, I have a lot of opportunity right around the top of page 2! The next step would be to dig into what these keywords are to formulate a plan to move them to the first page. We’ll cover that in Step 4 of this post. What they are ranking for. Let’s note that your search results competitors may also be your business competitors, but they also may not be. Many companies determine their business competitors to be those offering the same sort of product as you (even if features, pricing, and market positioning are different), but we often see that search competitors can be broader especially when not all of your keywords are super relevant to your business. 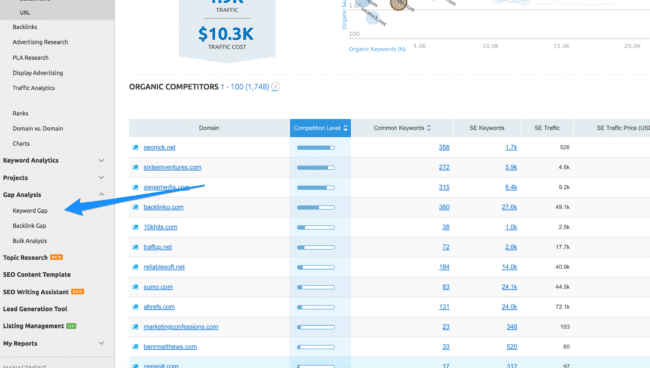 To find your search competitors, go back to your domain’s page on SEMrush, which will be something like https://www.semrush.com/info/YOURSITE.com. Take note here of each of your competitors. 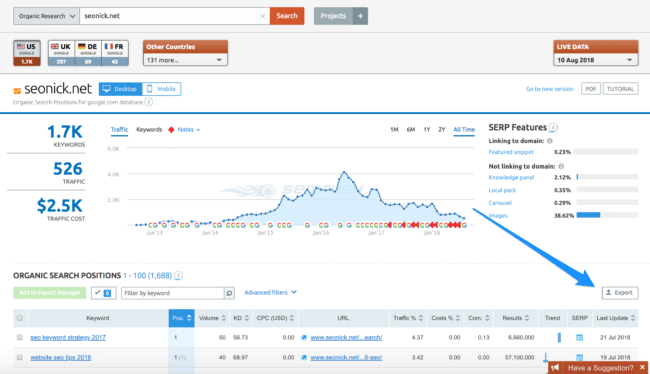 This step is fairly easy because we will get into a competitor keyword gap analysis in the next section using SEMrush’s tools. Repeat this and export for all. 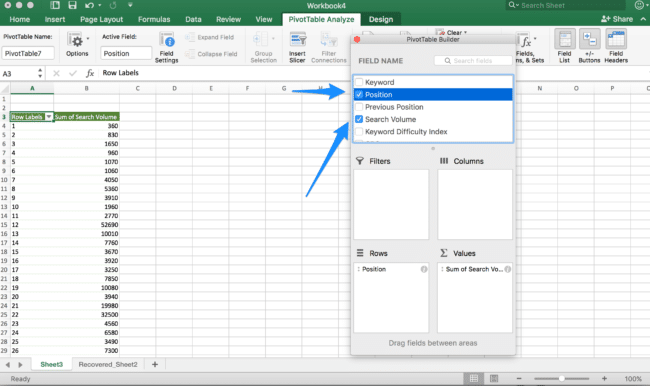 Another way to do a competitor keyword analysis that gives you deeper insight is to do it manually in Excel utilizing VLOOKUPs and multiple sheets. A master sheet and a sheet for each competitor. 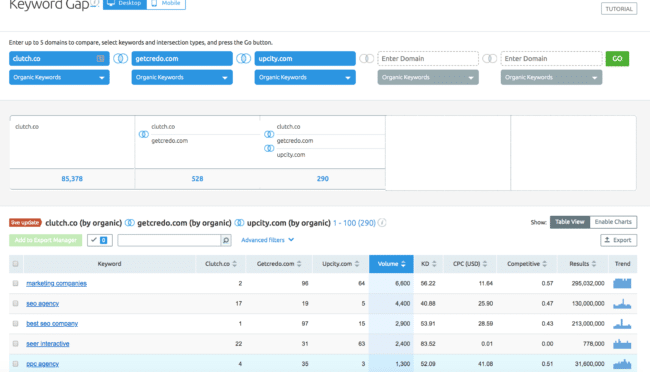 The first thing to do is download all of your competitor’s keywords, or at minimum their top 10,000 that are relevant to your business as well (or that section of their site). From here you can Copy > Paste Values to remove the formulas, then Replace All of the #N/A values with a value showing that they do not rank. I like using 100+, but some will use 0. I do not use 0 because many in SEO now talk about Position 0, which is a Featured Snippet or Answer Box. 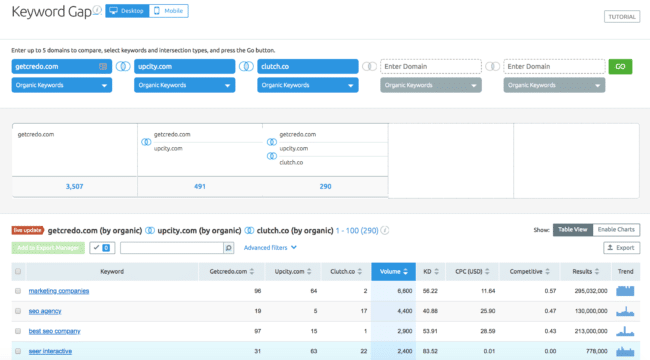 Now comes the part where you need to analyze the data and manually categorize the types of keywords that you and your competitors are ranking for. 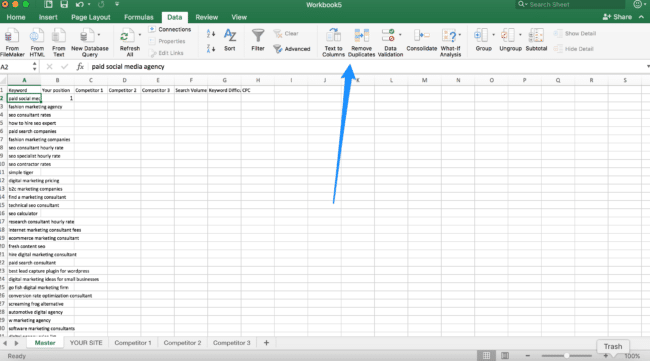 From here I can create a plan for each bucket of keywords. Build links to these pages so that they rank on the first page. This will require a shift of strategy, but could net us NBED more visitors per month. As you can see the details still need to be fleshed out, but a high level strategy like this is where you start. You can then repeat this across the different areas and come up with strategies to rank. You may notice that I have not talked about “backlinks” at all in this article. This article is specifically meant to help you understand the potential search volume you have based on your current rankings and your competitors, and you start to put together the strategy to rank better should it make sense for your business. Links are very important to SEO, and often the answer why a competitor ranks better than you is that “they have more links”. This is absolutely true in my case. Acquiring links is the hardest part of SEO, which is why they are so valuable as well. More links from authoritative websites. 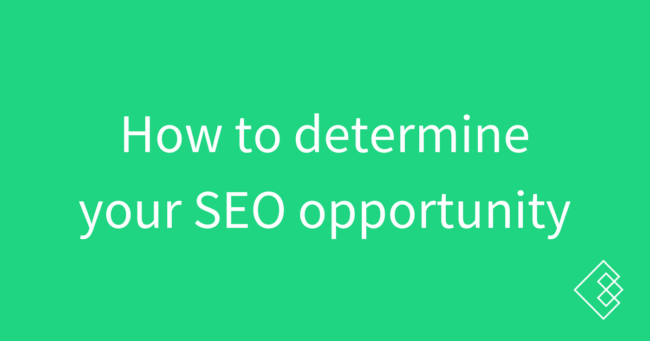 A great SEO campaign starts with understanding your potential, what your competitors are ranking for, and then a strategy to go after that opportunity. Take the spreadsheet we provide and do it yourself, or contact us about doing it for you.